Architecture has always been a magnificent and much debated platform to express the spirit of the times, worldviews, everyday life, and aesthetics. It is a daring materialization of private and public visions, of applied art and the avant-garde alike. Concrete – Photography and Architecture presents images of iconic urban architectures and townscapes that refelct the close and complex union between photography and architecture, between architect and photographer. Starting from the 19th century, when photography was invented, the book picks up positions, juxtapositions, and thematic fields that bring together the concrete, fundamental, and the historic. Besides of everyday architecture and glamorous buildings, it looks also at structural horizontal and vertical axes; houses and homes; utopias, plans and reality; the captivating transience of architecture against the test of time; and destruction both natural and intentional. 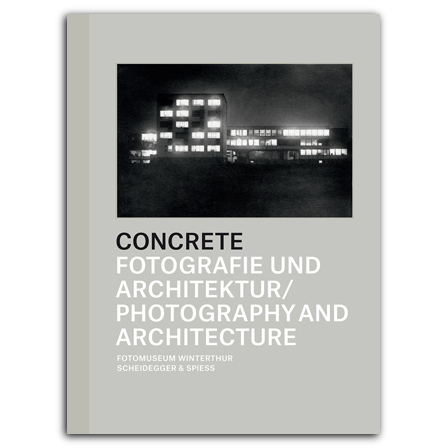 The book is published to coincide with the exhibition Concrete – Photography and Architecture at Fotomuseum Winterthur. Essays by Jochen Becker, Johannes Binotto, Verena Huber Nievergelt, Michael Jakob, Nicoletta Leonardi, Lorenzo Rocha, Caspar Schärer, Aveek Sen, Urs Stahel, and a discussion with Annette Gigon and Armin Linke. Winner of the DAM Architectural Book Award 2013.